The Internet is a vast network that connects many independent networks and links computers at different locations. It enables computer users throughout the world to communicate and to share information in a variety of ways. 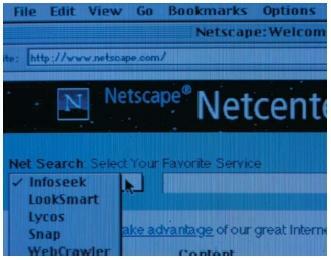 Its evolution into the World Wide Web made it easy to use for those with no prior computer training. The Internet could not exist until the modern computer came to be. The first electronic computers were developed during the 1940s, and these early machines were so large—mainly because of all the bulky vacuum tubes they needed to perform calculations—that they often took up an entire room by themselves. They were also very expensive, and only a few corporations and government agencies could afford to own one. The decade of the 1950s proved to be one of silent conflict and tension between the Soviet Union and the United States—a period called the "cold war"—and computers naturally came to play a large role in those nations' military planning. Since each country was obsessed with the possibility of a deliberate or accidental nuclear war breaking out, the United States began to consider how it might protect its valuable lines of communication in case such a disaster did occur. By the 1960s, both nations had become increasingly dependent on their rapidly-improving computing technologies, and the United States eventually developed a means of linking its major defense-related computer facilities together (to form a network). In 1969, the U.S. Department of Defense began a network of university and military computers that it called ARPANET (Advanced Research Projects Agency Network). HTML: HyperText Markup Language, used in writing pages for the World Wide Web; it lets the text include codes that define font, layout, embedded graphics, and hypertext links. HTTP: HyperText Transfer Protocol, which is the way World Wide Web pages are transferred over the Internet. Hypertext: System of writing and displaying text that enables the text to be linked in multiple ways, to be available on several levels of detail, and to contain links to related documents. Links: Electronic connections between pieces of information. Network: A system made up of lines or paths for data flow that includes nodes where the lines intersect and where the data can flow into different lines. Packets: Small batches of data that computers exchange. Protocols: Rules or standards for operations and behavior. World Wide Web: A hypermedia system that is a graphical map for the Internet, that is simple to understand, and that helps users navigate around Internet sites. The major characteristic of ARPANET was the way it used the new idea called "packet switching." What this does is break up data—or information to be transmitted from one computer to another—into pieces or "packets" of equal-size message units. These pieces or packets are then sent separately to their destination where they are finally reassembled to reform the complete message. So by "packet switching" data, a message is sent in pieces or segments, each of which may travel a different route to the same destination, where it is eventually put back together, no matter how or which way it got there. For defense purposes, this system seemed ideal since if there were any working path to the final destination, no matter how indirect, the new network would find it and use it to get the message through. In 1970, ARPANET began operations between only four universities, but by the end of 1971, ARPANET was linking twenty-three host computers. 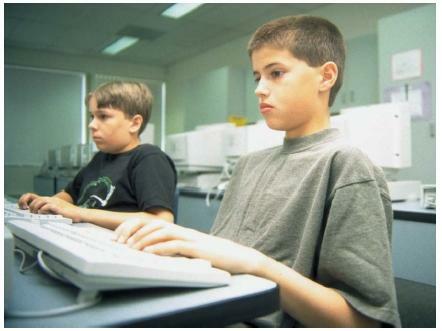 As this system slowly grew, it became apparent that eventually the computers at each different location would need to follow the same rules and procedures if they were to communicate with one another. In fact, if they all went their separate ways and spoke a different "language" and operated under different instructions, then they could never really be linked together in any meaningful way. More and more, the scientists, engineers, librarians, and computer experts who were then using ARPANET found that the network was both highly complex and very difficult to use. As early as 1972, users were beginning to form a sort of bulletin board for what we now call e-mail (electronic mail). This made the need for common procedures even more obvious, and in 1974, what came to be called a common protocol (pronounced PRO-tuh-call) was finally developed. Protocols are sets of rules that standardize how something is done so that everyone knows what to do and what to expect—sort of like the rules of a game. This common language was known as a Transmission Control Protocol/Internet Protocol (TCP/IP). The development of this protocol proved to be a crucial step in the development of a real, working network since it established certain rules or procedures that eventually would allow the network really to expand. One of the keys of the protocol was that it was designed with what was called "open architecture." This meant that each network would be able to work on its own and not have to modify itself in any way in order to be part of the network. This would be taken care of by a "gateway" (usually a larger computer) that each network would have whose special software linked it to the outside world. In order to make sure that data was transmitted quickly, the gateway software was designed so that it would not hold on to any of the data that passed through it. This not only sped things up, but it also removed any possibility of censorship or central control. Finally, data would always follow the fastest available route, and all networks were allowed to participate. In practice, the new TCP/IP set up a system that is often compared to a postal system. The information being sent or the "data packets" would have headers just as a letter has an address on its envelope. The header would therefore specify where it came from and what its destination was. Just as everyone's postal rules (protocols) state that all mail must be in an envelope or some sort of package and that it must have postage and a destination address, so TCP/IP said that every computer connected to the network must have a unique address. When the electronic packet was sent to the routing computer, it would sort through tables of addresses just as a mail sorter in a post office sorts through zip codes. It would then select the best connection or available route and send it along. On the receiving end, the TCP/IP software made sure all the pieces of the packet were there and then it put them back together in proper order, ready to be used. It makes no difference (other than speed) to the network how the data was transmitted, and one computer can communicate with another using regular phone lines, fiber-optic cables, radio links, or even satellites. All of this took some time, but by the beginning of 1983, when the TCP/IP was ready to go and finally adopted, the Internet—or a network of networks—was finally born. To this point, most of the business on the "Net," as it came to be called, was science-oriented. About this same time, however, the microcomputer revolution was also starting to be felt. Called "personal computers," these new, smaller, desktop-size computers began slowly to enter businesses and homes, eventually transforming the notion of what a computer was. Until this time, a computer was a very large, super-expensive, anonymous-looking machine (called a "mainframe") that only corporations could afford. Now however, a computer was a friendly, nearly-portable, personal machine that had a monitor or screen like a television set. As more and more individuals purchased a personal computer and eventually learned about a way of talking to another computer (via e-mail), the brand-new Internet soon began to experience the problems of its own success. By 1984, it was apparent that something had to be done to straighten out and simplify the naming system for each "host" computer (the host was the "server" computer that was actually linked to the Internet). That year, the system called "Domain Name Servers" was created. This new system organized Internet addresses into various "domains" or categories—such as governmental (.gov), commercial (.com), educational (.edu), military (.mil), network sites (.net), or international organizations (.org)—that were tacked onto the end of the address. Host or server names now were not only much easier to remember, but the alphabetical addresses themselves actually stood for a longer coded sequence of numbers that the computer needed in order to specifically identify an address. Thus, a person needed only to use a fairly short alphabetical address, which itself contained the more complex numerical sequence. By 2001, however, an entire batch of additional domain names (.biz, .info, .name,.museum, .aero, .coop, and .pro) had to be created to account for the increase in both specialization and use. This domain expansion is similar to the phone company issuing new area codes. and universities. NSFNET adopted the TCP/IP rules, but it did not allow its system to be used for non-educational purposes. This policy proved to be very important since it eventually led businesses to create networks of their own, and also encouraged several private "providers" to open for business. 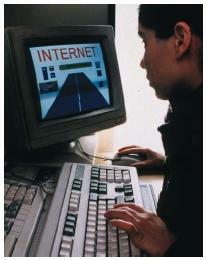 In 1987, the first subscription-based commercial Internet company, called UUNET, was founded. As the end of the 1980s approached, the Internet was growing, but it was still not the place for a beginner. The main problem was that every time users wanted to do something different on it (such as e-mail or file transfer), they had to know how to operate an entirely separate program. Commands had to be either memorized or reference manuals had to be constantly consulted. The Internet was not "user-friendly." The development of what came to be called the World Wide Web in 1991 marked the real breakthrough of the Internet to a mass audience of users. The World Wide Web is really a software package that was based on "hypertext." In hypertext, links are "embedded" in the text (meaning that certain key words are either underlined or appear in a contrasting sdifferent color) that the user can then click on with a mouse to be taken to another site containing more information. It was the development of the Web that made usage of the Internet really take off, since it was simple to understand and use and enabled even new users to be able to explore or "surf" the Net. Without the World Wide Web, the Internet probably would have remained a mystery to those huge numbers of people who either had no computer expertise or wanted any computer training. was limited only to text or words. However, as a "graphical browser," the Mosaic program included multimedia links, meaning that a user could click on icons (pictures of symbols) and view pictures, listen to audio, and even see video. By 1995, with the addition of sound and graphics and the emergence of such large commercial providers as America Online (AOL), Prodigy, and Compuserv, interest and usage of the Internet really took off. Internet also has commercial possibilities, and users can find almost any type of product being sold there. A person with a credit card can book an airline flight, rent a beach home and car, reserve tickets to a performance, and buy nearly anything else he or she desires. Some businesses benefit from this more than others, but there is no dismissing the fact that the Internet has changed the way business is conducted. Used daily for thousands of other reasons, the Internet is many things to many people. It is a world-wide broadcasting medium, a mechanism for interacting with others, and a mechanism for obtaining and disseminating information. Today, the Internet has become an integral part of our world, and most would agree that its usefulness is limited only by our imagination.